Promoting international joint research is a key component to our research and educational goals at the Arctic Center. Consequently, we are continuously expanding our international collaborative network. 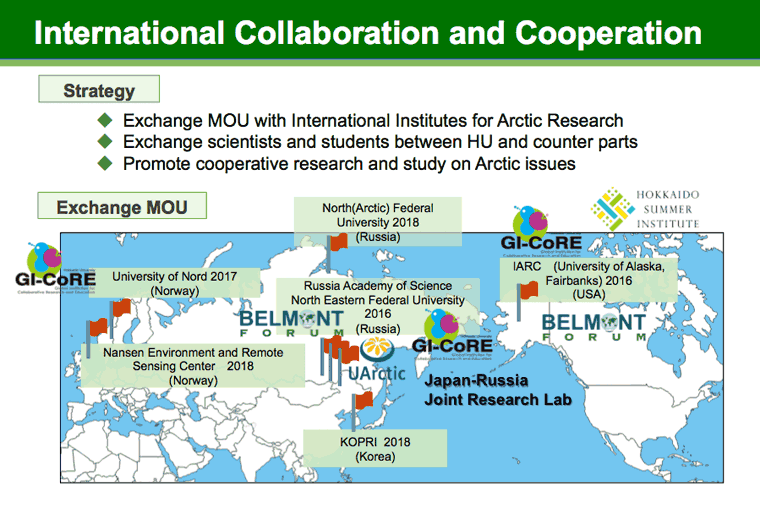 Recent successful agreements include (i) a MOU with the International Arctic Research Center of University of Alaska Fairbanks (August 1, 2016), (ii) a Japan-Russia joint research agreement between the North Eastern Federal University（NEFU）in the Russian Federation of SAHA, and the Russia National Academy of Science (October 31, 2016), (iii) the continuation of our winter school in March, 2017 and February, 2018 as part of an upbringing program of human resources of J-ARC Net which used this laboratory. Additionally several MOU and LOU were exchanged between different international Arctic institutions and our center during the fiscal year 2017 (see figure). Current international projects and collaborative activities include the following.